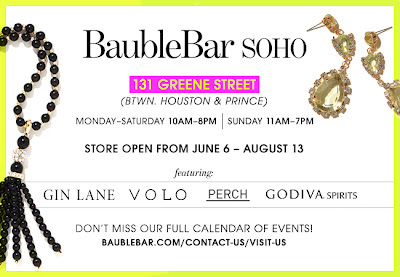 BaubleBar is back, with their second pop-up store this year in Manhattan, opening June 6th at 131 Greene Street in SoHo. The 2-month pop-up shop (4,000 square feet) will be open through August 13th, featuring the same items available on its site and will serve as the launching pad for national pop-ups. Store hours are Monday through Saturday from 10 a.m. to 8 p.m. and Sundays between 11 a.m. and 7 p.m.
At the pop-up, you can build your dream accessories wardrobe using any of the on-hand services, including styling sessions from BaubleBar's SWAT stylists, an interactive guide to wearing our essentials, and a Personalization App, built by Gin Lane Media, that lets you "build before you buy" with BaubleBar's suite of best-selling customized pieces. While you shop, stop by the Indulgence Bar and sample specialty Godiva Spirits and cocktails. Customers can also snap pictures of themselves at BaubleBar's photobooth. Customers can also post a pic on Instagram using the hashtag #BaubleBar, and swing by the photobooth to grab a print-out of the Instagram. For a full list of BaubleBar Soho pop-up shop events, click here.